Although all Middle School and High School programs of study require core whole-class nonfiction readings, as often as possible, students should choose nonfiction informational reading that hooks their personal interest. The kids will be more inclined to want to read a topic of their choice (ownership) which will lead to the desire to express their thoughts and interpretations clearly and coherently. Their reading and writing proficiencies will blossom and solidify. This is a win-win teaching/learning idea for teachers and students. 1. Almost 2-pages of Teacher Notes and teaching suggestions. 2. A Student Directions page that lists Types of Articles as well as Types of Newspapers, Magazines, Online article sources and Texts. 5. A format for students to expand their writing proficiency by turning a summary into a full-length essay. 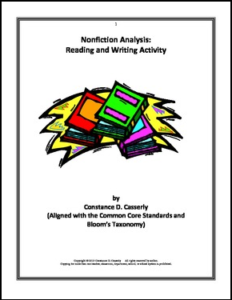 This FREE Common Core and Bloom’s Taxonomy aligned activity should be used with any core nonfiction reading as well as for raising reading comprehension thinking and writing skills proficiencies.